In my first post, I wrote about our preparations for this trip. In my second post, I wrote about our first day on the North Coast 500, which ended with us turning West at John O’Groats and driving along the top of Scotland. 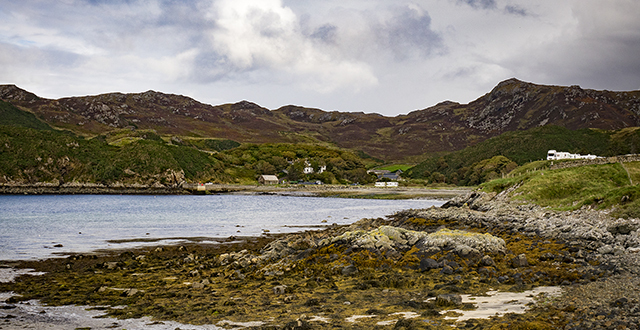 In this post, I will describe our journey from Melvich to Lochinver, with a detour to Stoer in Sutherland on the West coast of Sutherland. We continued to head West on the A836 through terrain that was much more rugged. Heavy clouds were overhead and we saw rainbows every day of our trip. We were still on quick roads on this part of the journey and were making good progress. In the village of Tongue, we switched to the A838, which gave us an excellent view of the ruins of Castle Varrich, which is believed to be a thousand years old. 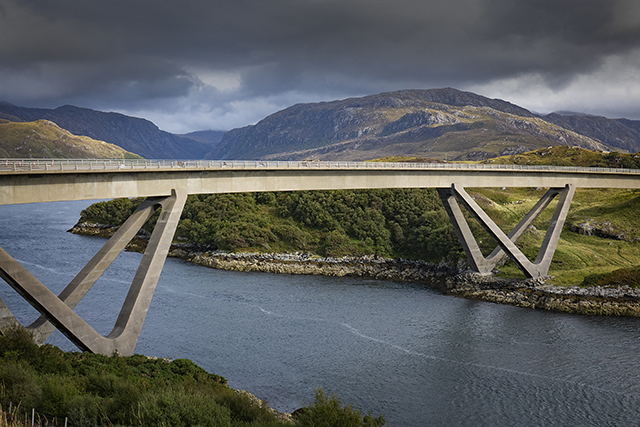 The causeway and bridge over the Kyle of Tongue were built in 1971 to replace a ferry or a 10 mile drive on a single track road. It was in the Kyle of Tongue in 1746 that two Royal Navy ships stopped a Jacobite ship from landing French gold that was intended for Bonnie Prince Charlie. Some historians believe this this had a significant impact on his campaign to claim back the throne. Some years ago, a late uncle of mine was working as a GP locum in this village. He had graduated from Edinburgh University in 1948 and was one of the first graduates to join the newly created National Health Service. The Mail on Sunday decided to run a couple of articles, tracing what had happened to “the class of 48”. They sent a photographer to take some pictures of him. Having got the “proper” photos, the photographer suggested that – just for fun – he should take one of my uncle next to the sign for Tongue, with his tongue sticking out. This was only going to be for the family. Of course. Guess which photo The Mail on Sunday used? My uncle had a great sense of humour and thought it was really funny. 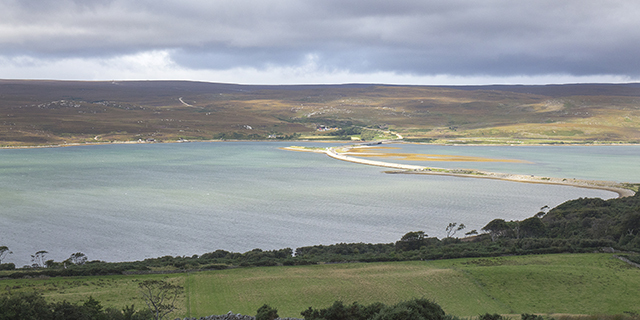 As we headed over to the west coast, the roads became twistier and, as we travelled down the eastern side of Loch Eriboll, the road ahead became a single track with passing places. Traffic was quite light and we had no delays. 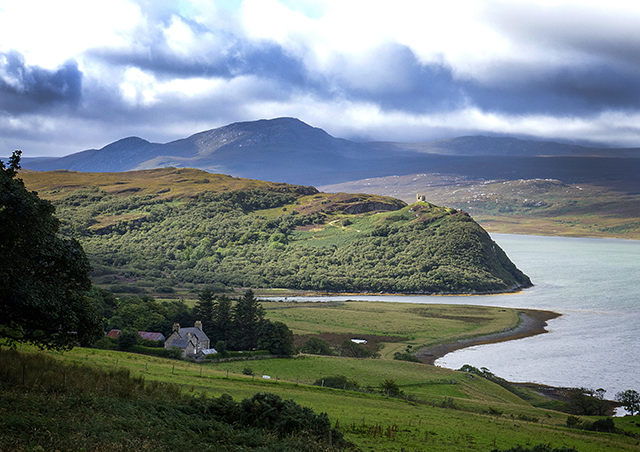 Loch Eriboll is a sea loch that is almost 10 miles long. During World War 2, the Royal Navy used it as a deep water anchorage. It enjoys much calmer weather than in the nearby seas around the Pentland Firth and Cape Wrath. In May 1945, the surviving 33 U Boats of the German Kreigsmarine came in from the Atlantic and surrendered to the Royal Navy in Loch Eriboll. The majority of them were scuttled in the North Atlantic as part of Operation Deadlight. 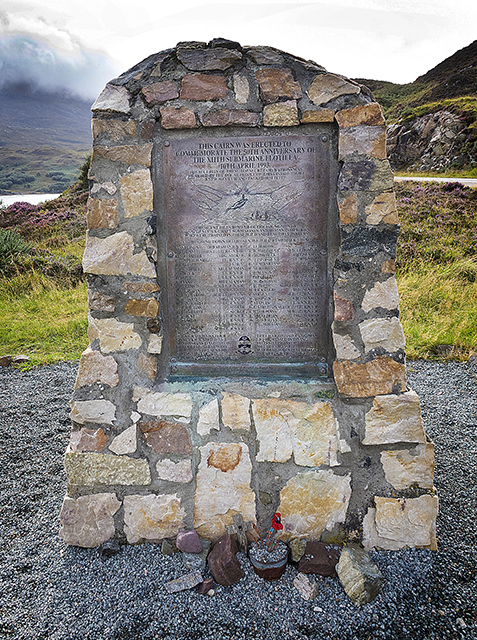 On the way between Loch Eriboll and Durness, we stopped to look at the beach at Ceannabeinne and saw a memorial to a very sad time in the history of the Scottish Highlands – the Highland Clearances. All across the Highlands of Scotland, you can see the ruins of cottages that were abandoned when the families were forcibly evicted to make way for sheep. It is one of the darker chapters in this country’s history that has had little coverage in the history books. All that remains of the village is an empty white cottage that used to be the school house. A few miles after Durness, the road became two lanes again and, at Laxford Bridge, we turned onto the A894, which would eventually take us to the West coast at Scourie. On the way, we had some incredible views. 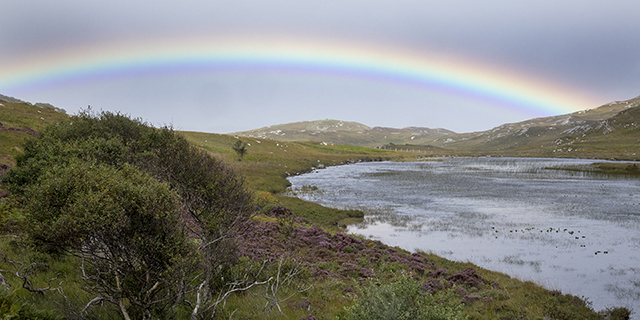 We stopped by a “Lochan” (a small loch) that was framed by a menacing sky. Not far after, I stopped to take some photos of the beautiful Loch Glendu and the Glendu Forest. 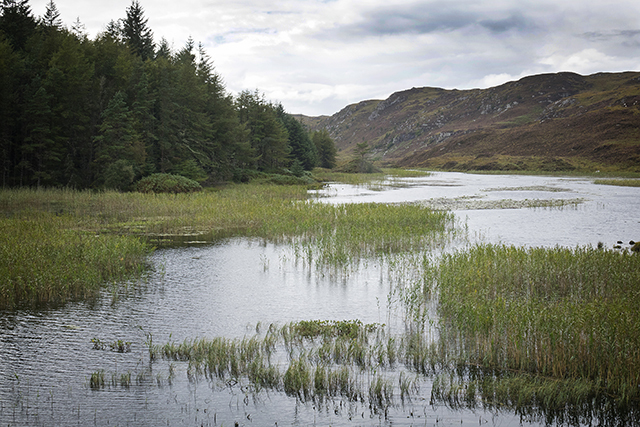 This is an area of dramatic changes in scenery; remote, wild and beautiful in equal measure. I can think of nowhere else in the UK that you can see such contrasts in scenery in such a short space of time. In 1984, a year after I did this trip on my own, a bridge was opened at Kylescu by HM Queen Elizabeth II, replacing the free ferry service, though you can still see one of the old ferry boats parked up at the side of Loch Gleann Dubh. Perhaps this was the one that I travelled on in 1983? The bridge has won awards for its design and there is a car park which gives you a good vantage point to take photos of the bridge. On one side of the car park is a memorial to the crews of the X-Craft miniature submarines, who, during World War II, trained in this area. Nearby is the waterfall Eas a’ Chual Aluinn (waterfall of the beautiful tresses) which is the highest waterfall in Britain. With a sheer drop of 658 feet / 200 metres, when it is in full flow, it is three times the height of Niagra Falls. Instead of staying on the A894, which would take us to Lochinver via Loch Assynt, we took the single track B869 out to the tiny village of Stoer, where my father was born in 1925. I have a family tree that goes back to 1715 and which confirms that my “Sept” of the Matheson Clan came from Assynt. I remember spending a holiday here as a very young child in a hamlet called Achnacarnin. The house we stayed in was lit by oil lamps as the hamlet did not have electricity and we drew fresh water from a well. Things are a bit more civilised nowadays in this part of Scotland. We spent that night at the Inver Lodge Hotel, in Lochinver, which sits on a hillside that has a wonderful view over Lochinver Harbour. This is an excellent hotel but it isn’t in the budget category, if that’s what you are looking for. But then the 6th of September was a special birthday for my wife, Liz, so we had dinner in the Albert Roux run restaurant in the hotel. Our dinner was superb. As a rule, Scottish hotels – at all price levels – pride themselves on the quality of their food and try to showcase local produce at every opportunity. Every hotel we’ve ever stayed in, in Scotland, offers a Breakfast menu that would be a challenge to even the hungriest guest. Including our detour, we had travelled 124 miles at an average speed of just under 29 mph. 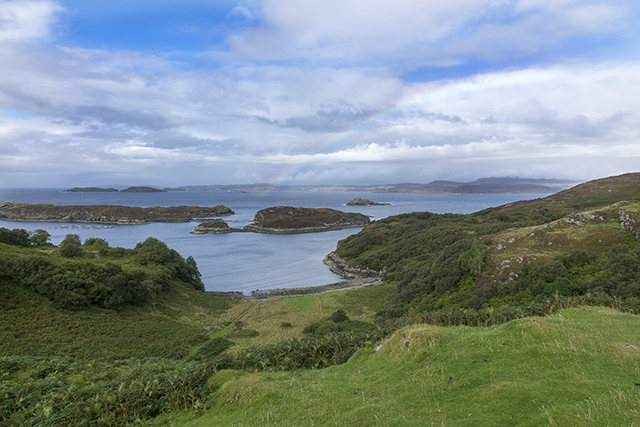 In my next post, I will describe our journey from Lochinver to Shieldaig in Wester Ross. In my previous post, I spoke about the prepraration and planning that is required before you attempt Scotland’s North Coast 500 route, round Caithness, Sutherland and Wester Ross. Today, I will tell you about our first day on the route, which takes us from Inverness to Melvich, via Brora, Wick, John O’Groats and Thurso. You leave Inverness on the A9, which passes over the Beauly Firth via the North Kessock Bridge into the Black Isle (which is actually a peninsula.) 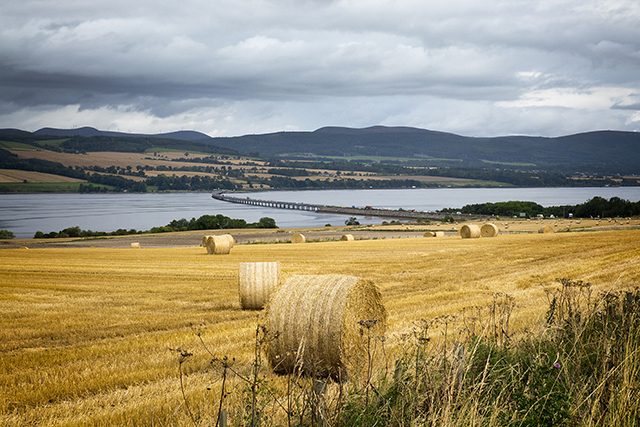 You then cross the Cromarty Firth via the Cromarty Bridge and travel on fast, open roads in the direction of the Dornoch Firth. 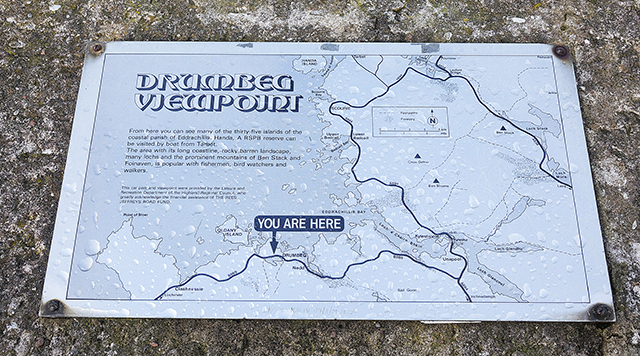 There are a huge number of distilleries along this route and one of the best visitor centres is at the Glenmorangie distillery, just outside Tain. A word of warning about distillery tours – the legal limit for alcohol in your bloodstream is 80mg per 100ml of blood in England, Wales and Northern Ireland but it is only 50mg in Scotland. 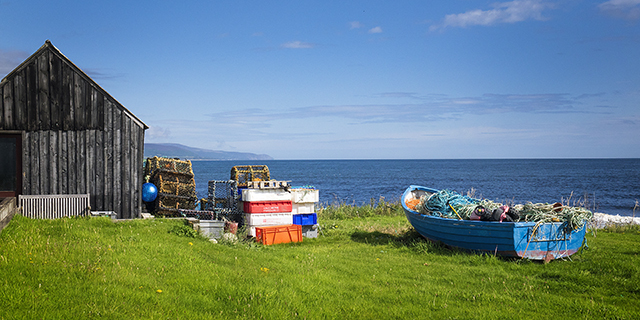 Further up the coast, we stopped at the village of Brora. We listened to the hiss of the sea as waves crashed onto its shingle beach, while sea birds screamed overhead. 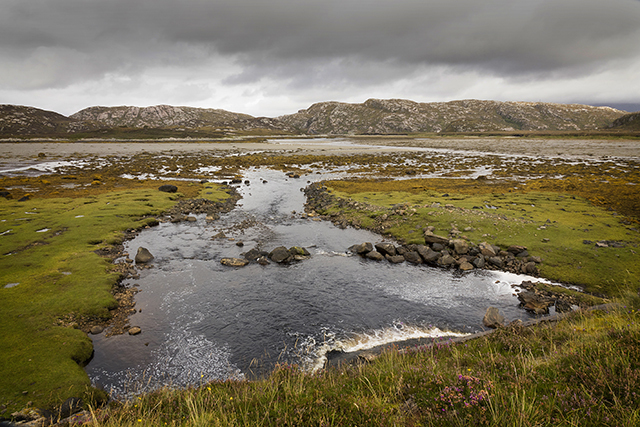 The more you travel on this route, the more aware you become of how the Scottish landscape has been shaped by water – Ice Age glaciers, fast-flowing rivers, the North Sea and the Atlantic Ocean. The A9 runs close to the coast all the way up to Latheron, where it turns north up to Thurso. If you want to stick on the official NC500, you need to turn onto the A99 which will take you to the town of Wick. Continuing along the A99, you will eventually reach John O’Groats at which point your turn west. 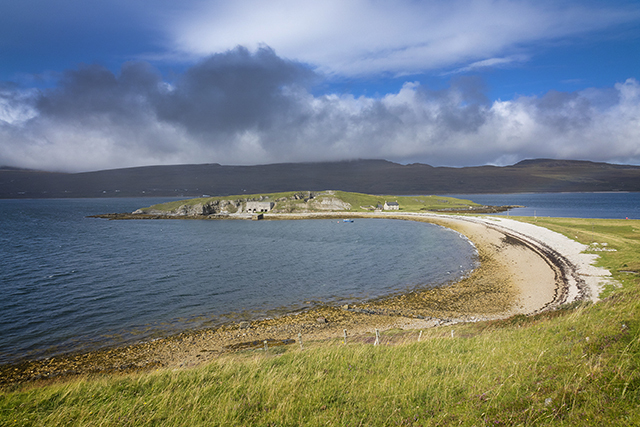 The NC500 now uses the A836 to go along the top of Scotland, with views of the island of Stroma and, beyond that, the Orkneys. 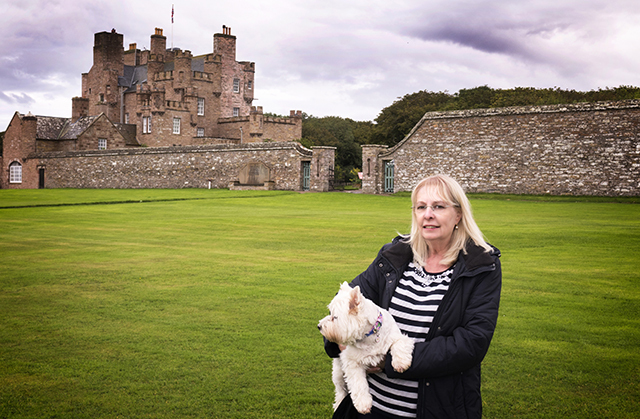 Worth a small detour is the Castle of Mey, previously owned by the Queen Mother and now owned by Prince Charles. It has a good visitor centre and a nice cafeteria. Rosie is a good traveller but we always plan a few stops en route to allow her to stretch her legs from time to time, or to have a drink of water. 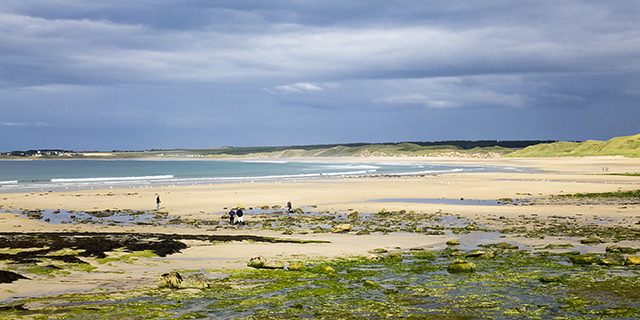 A few miles further on is Dunnet Bay which boasts an excellent micro distillery for gin and vodka called the Dunnet Bay Distillery. It was opened 3 years ago by a husband and wife team and the owners told me that they used to get 20-30 visitors a week. Since the launch of the NC500, they are now getting 200-300 visitors a week and so are building a visitors’ centre that will be open 7 days a week. This is where the increasingly popular Rock Rose gin is made in a still they call “Elizabeth.” As well as the generic Rock Rose gin, they make a limited edition run of gins for each of the four seasons of the year. If you like gin, this is a “must visit” on this tour. 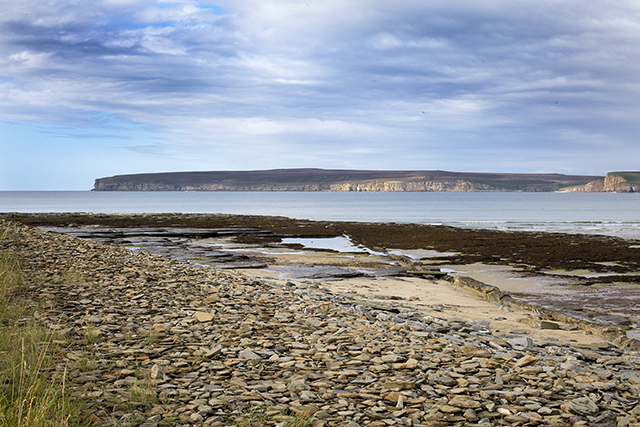 We carried on through the town of Thurso, which with a population of 8,000, is the most northerly town in Britain. Many of the people who live here arrived to work at Dounreay nuclear power station in the 1950s. It is now being decommissioned but remains a large employer of local people. For our first night on the North Coast 500, we stopped for the night in a very comfortable hotel in the village of Melvich, called The Melvich Hotel. One of our reasons for picking this (and the next two hotels) is that it is dog friendly. It also has a wood burning pizza oven and some lovely views out to sea. We saw the biggest full moon we have ever seen and we couldn’t believe how quickly it rose in the sky. Sadly, we never saw any Northern Lights on this trip. The hotel was full – I did warn you to book all your accomodation in advance. The hotel closes for the winter but I would not recommend that anyone tries to do the NC500 in the winter anyway. The weather can be awful and heavy snowfalls are common. On our first day on the NC500, we had covered 156 miles at an average speed of just over 40 miles an hour. This was the easy part of our journey completed. We knew the road ahead would be more of a challenge. In my next post, I will tell you about our journed from Melvich to Lochinver. Join me on the greatest motoring adventure in the British Isles on the North Coast 500 in Scotland. I’ll take you along some of the most challenging roads in the country and will show you some of the most amazing scenery that you will ever see in Britain. Deserted beaches made of silver and golden sand. Forbidding mountains covered in cloud. Dramatic changes of weather and places where there is a real sense of history in the air. You will see where the WW2 German Atlantic U Boat fleet surrendered to the Royal Navy in 1945. You will also see where a Jacobite ship, loaded with French gold for Bonnie Prince Charlie, was captured by the English Navy in 1746. I’ll show you a “ghost village” that stands as a sad memorial to the Highland Clearances in the 1840s and the memorial by the loch where the heroic X-Craft Submariners were trained in WW2. I’ll also show you a pretty village where you can buy what I consider to be the finest smoked salmon in the country, direct from the smokehouse. In the same village you can watch 2.5 metre wing spanned Sea Eagles with the naked eye from the roadside. You will be given plenty of tips to help you plan your own journey. This is a trip that requires a lot of preparation both for your safety and your enjoyment. 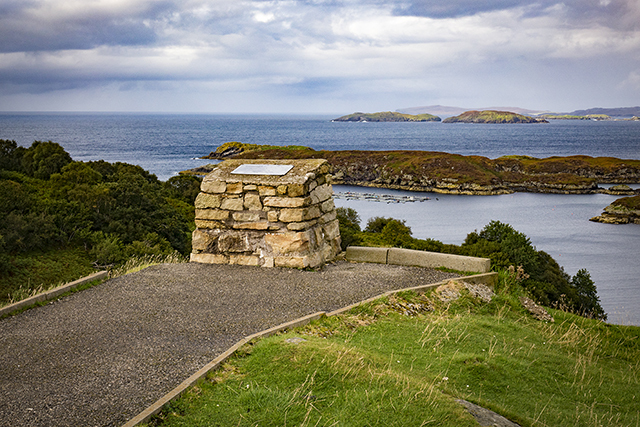 In 2015, the Tourism Project Board of the North Highland Initiative launched the concept of the “North Coast 500.” It is now commonly referred to as the NC500. The idea was to increase tourism in the counties of Ross-shire, Sutherland and Caithness, by encouraging people to travel on existing roads around the coast of each county. 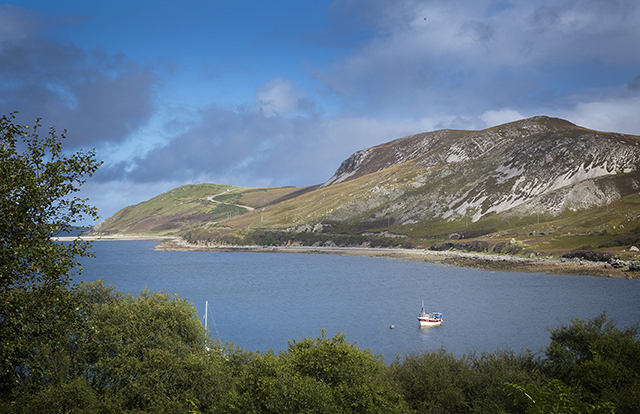 From start to finish, it is about 500 miles long and will take you through some of the most dramatic scenery in Britain. Very few people who you know will have covered the North Coast 500, which is now being compared to Route 66 in America as one of the greatest drives in the world. 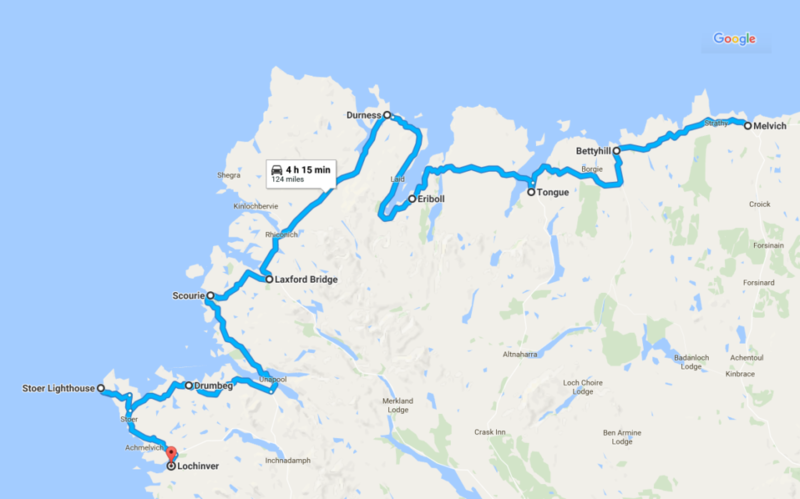 These articles are not meant to be a comprehensive guide to the North Coast 500. In addition to resources on the internet, the best book to read is “The North Coast 500 Guide Book” by Charles Tait. At the time of writing, costs £12.95 and is worth every penny. What I hope these articles do is to give you a taste of a remarkable part of our country that very few will have ever visited, coupled with some helpful hints to make your trip successful and safe. 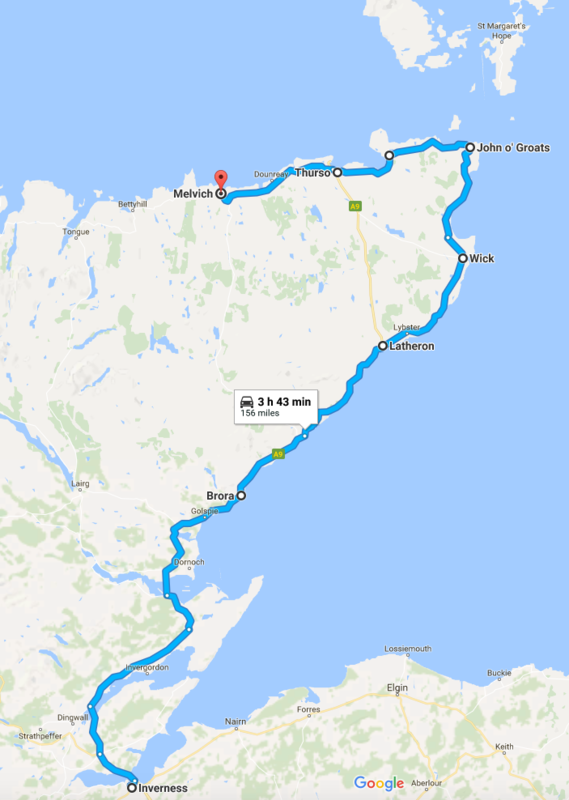 Long before anyone thought of the name “North Coast 500”, I drove this route in 1983, on my own. I didn’t stop very much to admire the scenery – which I should have done. 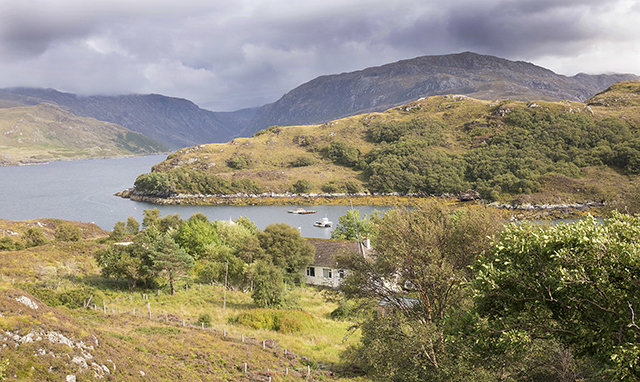 In a recent readers’ poll of the Rough Guide, Scotland was voted the most beautiful country in the world. Our recent trip round this route reminded us just why. Officially, the route starts at Inverness Castle, heads west and goes clockwise round the coast. Back in 1983, I did it anti-clockwise and my wife, Liz and I did it that way again this year. I would encourage readers to do the same, particularly if you are not used to driving on twisty single-track roads. You encounter these quite early on in the clockwise route. This can be a bit off putting for anyone who is not used to roads like these. 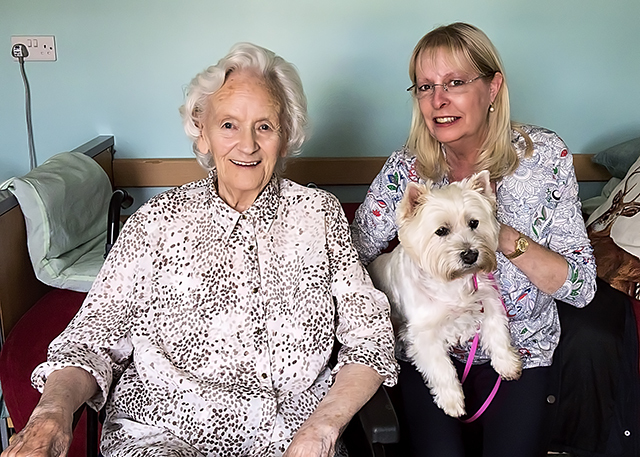 Twice a year, my wife Liz, our West Highland Terrier, Rosie and I visit an Aunt of mine who lives in Dingwall, north of Inverness. Nanna (Gaelic for Anne – my mother’s family all spoke Gaelic) is 94 and is the last survivor of my mother’s generation. We combined a couple of visits to my Aunt and a visit to cousins I have on the West coast, with a trip round the NC500. This trip requires some serious planning. The success of the “NC500” concept has taken everyone by surprise and there is not yet the tourism infrastructure in place to cope with the surge in visitors. There aren’t enough hotels, bed and breakfasts or campsites to handle the number of visitors, so make sure that you book all your accommodation in advance. Some of the roads you will encounter on this route are not for inexperienced drivers or the faint-hearted. If you have driven on the Wrynose Pass or the Hardknott Pass in the Lake District, you will know what to expect. In my opinion, this route is not really suitable for caravans, though you do see a few on the route. We saw a lot of motorhomes on the route, many of which had been hired. If you have never driven a modern, large motorhome before, this is not the place to start. Winnebago size motorhomes are definitely unsuitable for this route. Because of the number of blind summits you come across, very low sports cars are also unsuitable. The route is also popular with motorcyclists (usually in pairs.) Cyclists and walkers use the NC500 as well, so keep an eye out for them all. Satellite navigation systems and mapping software calculate how long it will take you to reach your destination, based on the speed limit of the road you are travelling on. Apart from when you are in a town or a village, most of the NC500 is on the national speed limit of 60 mph. This is misleading as you will struggle to average 60 mph on even the best stretches of road. You would be lucky to achieve half this average speed on the single track roads. Allow yourself extra time for each stretch of your trip. This isn’t a race. Mobile phone coverage is patchy and broadband in hotels is often a bit hit and miss. It’s probably not the fault of the hotel, as much of this area is only now beginning to catch up with the rest of the country in communications. If you do need to be reachable for family or work reasons, circulate an itinerary of where you are staying each night, giving the phone number and e-mail address. 1. This route has become very popular with drivers from other European countries. You will see many cars and motorhomes with Dutch, Belgian, German and French number plates. The problem that these drivers sometimes have is when they are coming off single-track roads onto dual-track roads and they forget which side of the road to drive on. 2. Always be prepared to do an emergency stop in situations like this. As the single-track roads often have sheep grazing next to the road, they will sometimes wander out in front of you. If you are travelling in the early mornings, beware of deer on the roads. Many years ago, I had a Red Deer Stag jump over the roof of my car in this area. 3. Most people who will be travelling on Scotland’s NC500, will have travelled up on the A9 from Stirling to Inverness. 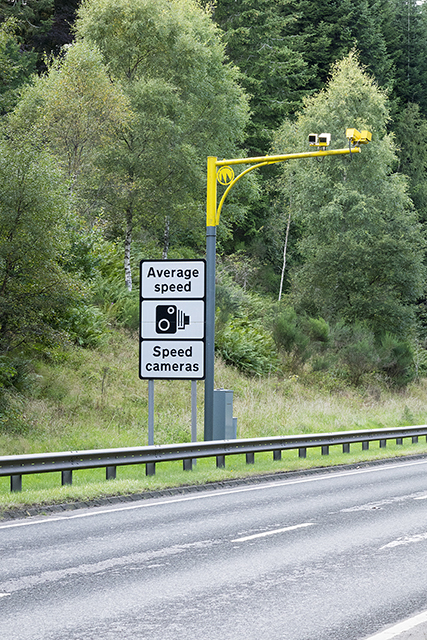 There are now average speed cameras along the entire length of the road and the speed limit for cars is 60 mph. For HGVs, the speed limit is 50 mph and you can sometimes find yourself sitting in a queue behind several HGVs. Be patient and admire the scenery. 4. There are not many convenience stores in villages on the NC500. Those that are open mostly sell the most awful sandwiches and snacks. A better idea is to ask the hotel or bed and breakfast you are staying in to make you up a packed lunch. They will welcome the extra business and you’ll get a much better lunch that you can find in the chill cabinet of a convenience store. 5. Do fill up your tank in Inverness, as the price of fuel en route is rather high. There are petrol stations but their remoteness is reflected in the prices you’ll pay, which are some of the highest in Scotland. I will give you three “top tips” to help you make this a really safe and enjoyable adventure at the end of my blog post about the fourth day we spent on the NC500. Click here to read about our first day on the North Coast 500, as we travel from Inverness to Melvich. 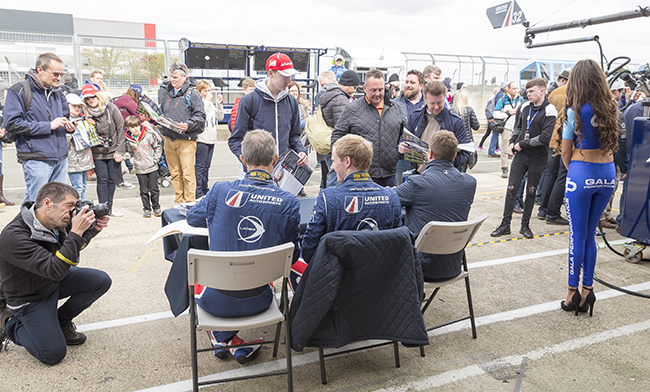 Join me as we go Access All Areas at the British round of the European Le Mans Series, at Silverstone in Northamptonshire. During a recent photographic assignment, I was able to meet up with Wayne Boyd, a racing driver who I last photographed a few years ago. He was about to take his Formula 3 car out at Oulton Park and was sitting in the Pit Lane. I had a pass that allowed me into the Paddock and Pits to photograph the “behind the scenes” images of a driver and his support crew. This type of racing is very different to the world of single seaters that Wayne originally came from. The races last for a total of 4 hours (hence the description “Endurance Racing”.) 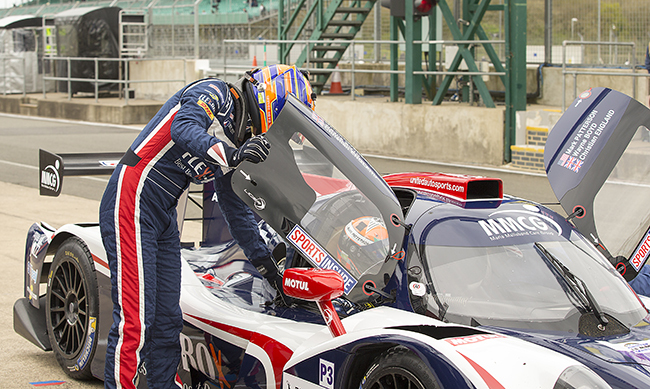 Wayne does the first hour of driving, followed by his two co-drivers, Christian England and Mark Patterson. Wayne then does the final hour’s driving. When you think that a Grand Prix normally lasts 90 minutes, it means Wayne is spending a third more time at the wheel than a GP driver. The only British round of this series took part in April at Silverstone circuit in Northamptonshire and I was the guest of Wayne and his team. It was great to be able to see behind the scenes of this highly organised Anglo American team. The team uses six HGVs to transport the cars and all the equipment needed to maintain them. 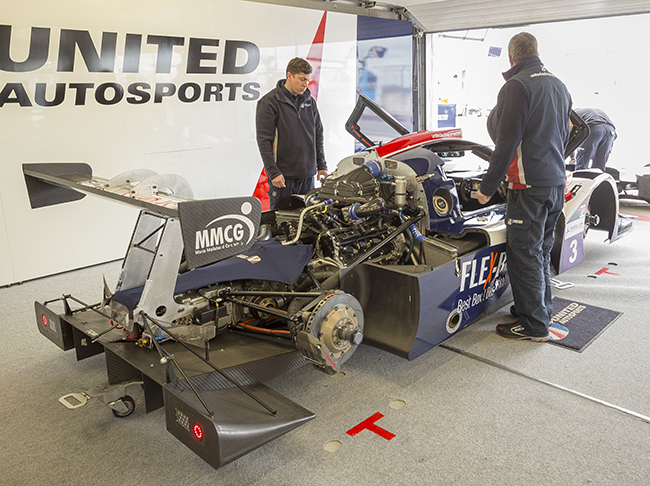 There is also a magnificent “Motorhome” that contains office space and a huge awning where the members of the team and their guests can enjoy United Autosports’ excellent hospitality. They have since raced at Monza in Italy and will also be racing at the Red Bull Ring in Austria, Circuit Paul Ricard in France, Spa Francorchamps in Belgium. The 2017 season will end in Portimao, Portugal. 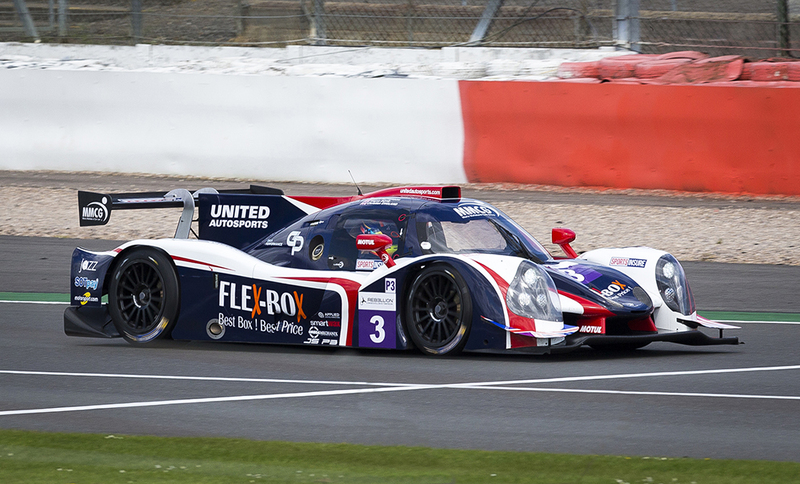 The car they use is a Ligier LMP3, which is built in France. The chassis and bodywork are made of carbon fibre and the whole car weighs just 900 kg. Power comes from a 5.0 litre V8 Nissan engine. Being allowed to go behind the scenes of a motor racing team is real privilege. I was allowed in to the pits, to photograph the three drivers practising changeovers and could see the mechanics working on the cars. 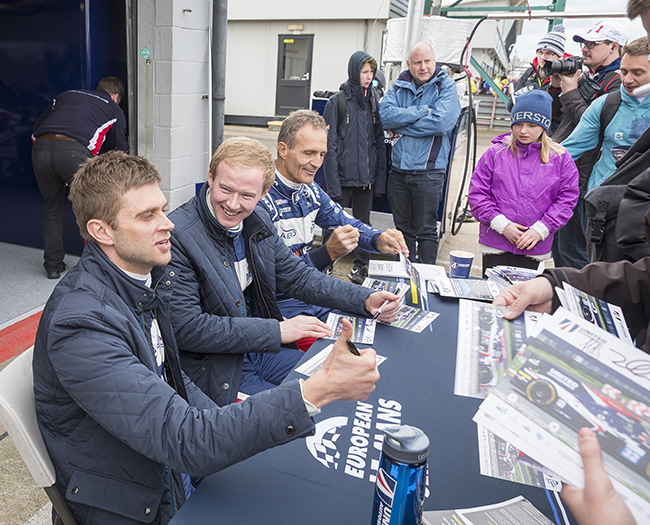 I then saw the drivers signing autographs during a pit lane walk that was open to the public. The rapport between the drivers and the spectators was great to watch. I have been to a few Grand Prix and it’s not like this in Formula One. On the track these cars are incredibly quick and quite difficult to photograph. On the day I was at Silverstone, the grandstands were closed to spectators. Like all Grand Prix racing circuits, Silverstone has very high wire fences to protect the public. I walked around the track, looking for a location that would give me an uninterrupted view of the track. I found one location on the inside of the first corner that gave me a view that would require very little work in Photoshop to lose the top of the wire fence. In the race itself, Wayne’s team finished fourth but after another team were disqualified over a technical infringement, Wayne’s team were promoted to third place – a good start to the season. If you’ve never tried photographing a racing car before but would like to try, the important thing to remember is to “pan” the camera. That means – swing it in the same direction that the car is moving. It needs a bit of practice to get this just right so try it out on slower cars first. By using the highest available shutter speed you can freeze the car, whilst blurring the background. This gives a good impression of speed. Racing cars – of all types – are either accelerating or braking. They never coast. I have found that the entry to a corner is often the best place to photograph cars, as they are slowing down. To get the shot of Wayne Boyd driving the Ligier, I used a Canon Eos 1Dx camera, with the shutter speed set to 12 frames a second. The lens used was a Canon 300 mm f2.8L MkII. Exposure was 1/1600 of a second at f7.1 and ISO 400. Autofocus was set to Servo mode. What is the unlikely connection between an apartment block in Barcelona, Spain and Star Wars, one of the most successful film franchises in history? 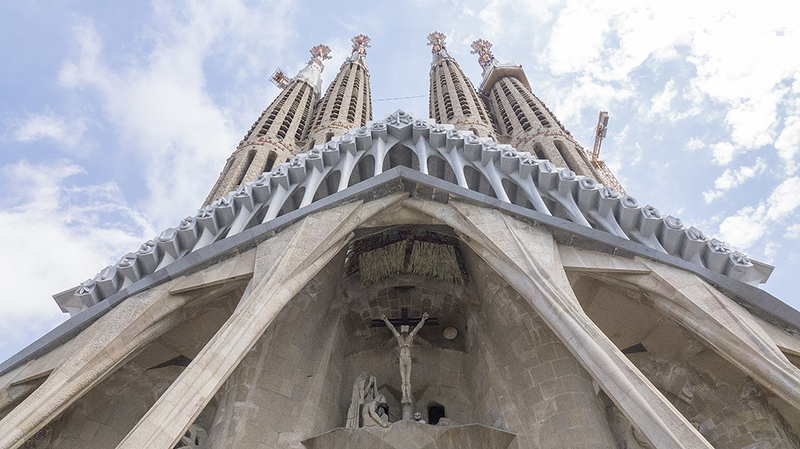 Most people have heard of Antoni Gaudi, the Catalonian architect responsible for the design of La Sagrada Familia in Barcelona. Work on this incredible Gothic and Art Nouveau church began in 1882 and continues to this day. 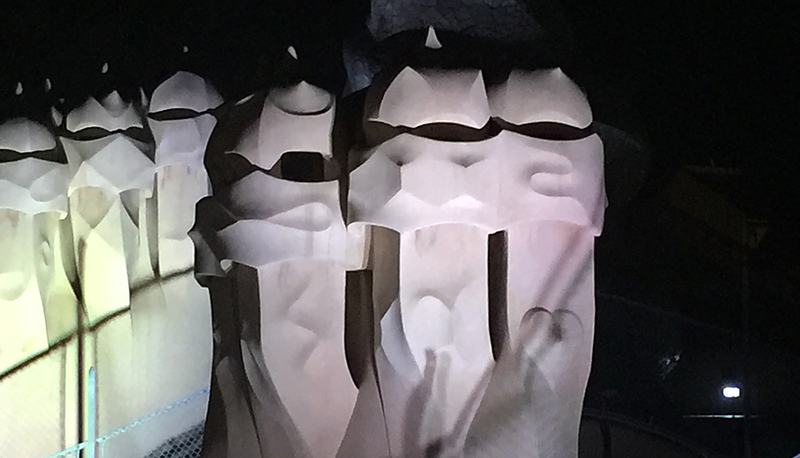 It is hoped that it will be completed in 2026, the centenary of Gaudi’s death. Sometimes known as “The Cathedral of the Poor”, it remains his most famous work. Gaudi designed many other buildings and one of the most well-known is the last private residence he designed. “Casa Mila” sits on the corner of Carrer de Provenca and Passeig de Gracia in Barcelona’s most fashionable shopping district and was completed in 1910. These days, it is better known by its less than complimentary nickname, “La Pedrera” (The Open Quarry) due to its rough external appearance. Gaudi drew his design inspiration from nature and stated that there were no straight lines in nature. Casa Mila was a controversial and much-criticised building that was not welcomed by residents of Passeig de Gracia at the time it was built. Now it is a UNESCO World Heritage Site and is one of the most popular tourist attractions in Barcelona. Star Wars fans who have made it this far, I’ve not forgotten you! Let’s have another look at the white vents in the photograph at the top of the page. Is there something vaguely familiar about them? In the 1970s, the American filmmaker George Lucas travelled to Barcelona. Like many tourists before and since, he paid a visit to Casa Mila and went to the rooftop of the building. The Galactic Stormtroopers’ helmets and body armour are amongst the most recognisable costumes in the history of cinema. They represent an unemotional force of terror. Or evil personified. Quite what the deeply religious Antoni Gaudi would have made of this, I really don’t know. But since the whole Star Wars franchise is essentially a Good v Evil story, where Good ultimately triumphs, I think he would be pleased. 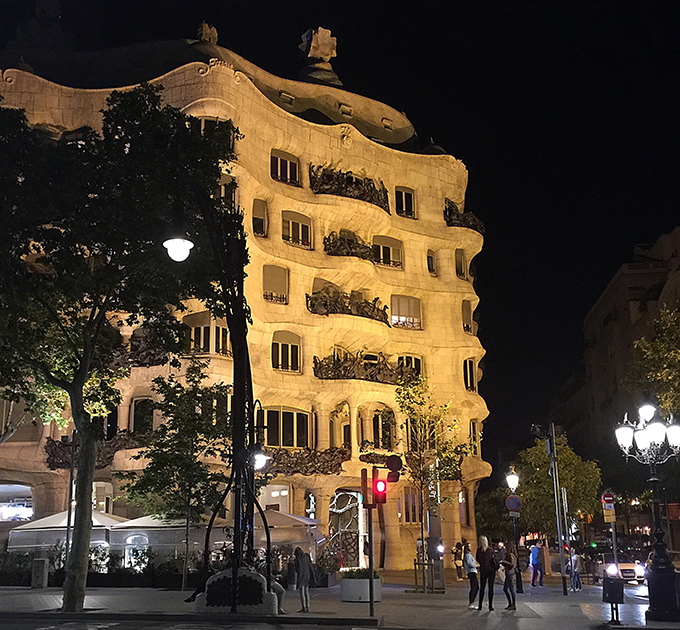 During a recent visit to Barcelona, we booked ourselves on a night time tour of the building, which culminates in a visit to the roof of Casa Mila. If you plan on doing the same, my advice is to use the elevator, rather than the stairs; the roof is seven floors up. The pain we go through for our readers! If you thought the main part of the building was strange, what you see on the roof is stranger still. Here, you will find a collection of skylights and staircase exits, chimneys, vents and water tanks, all in Gaudi’s unique, organic, style. There is an excellent “son et lumiere” each night, which shows these unusual features off at their best. First and third photos taken with an Apple iPhone 6 Plus. Hand held at night. Minimal processing done in the phone via the free Adobe Photoshop Express app. Second photo was taken with a Sony RX10 MkII with a 24mm-200mm lens set at 24mm. Exposure 1/800 second at f7.1. ISO 640. This photograph was taken exactly 50 years ago in the year that England won the World Cup. 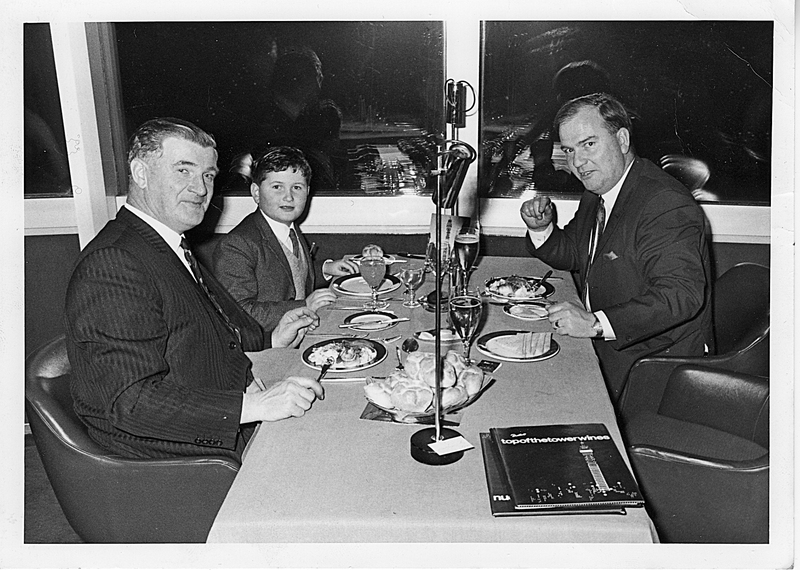 It was taken in the revolving restaurant on the (then GPO Tower) in London, which had opened in 1965. On the right is a gentleman called John Butters. On the left is a business colleague of his called John Matheson. Behind him is John Matheson’s rather earnest looking son. My parents are no longer with us. I found this photograph in a box of photos that were in my parents’ attic when I cleared their house out in 2014. I can remember every detail about this, 50 years on. It was at the Ideal Homes Exhibition and my highlight of that event was meeting the boxer Henry Cooper. An absolute gentleman. The lesson for everyone is – get your photographs printed, whether it is on your home computer / printer, one of the high street and supermarket outlets or by mail order. I know too many people who have lost years of memories when their smartphone or computer hard drive fails. Don’t trust digital back ups of your most precious memories. Whatever format of digital media you back up onto now will not be around for the next generation. Remember floppy discs and Betamax video? Yes – paper photos can be lost but I have a box of family photos that go back to before I was born and they still look good. I have a rather Zen view of photographs. I feel that if people aren’t viewing them then they might as well not exist. I’m getting this one framed and will keep it in my study. After 50 years of being in a box in the attic, that only seems right. 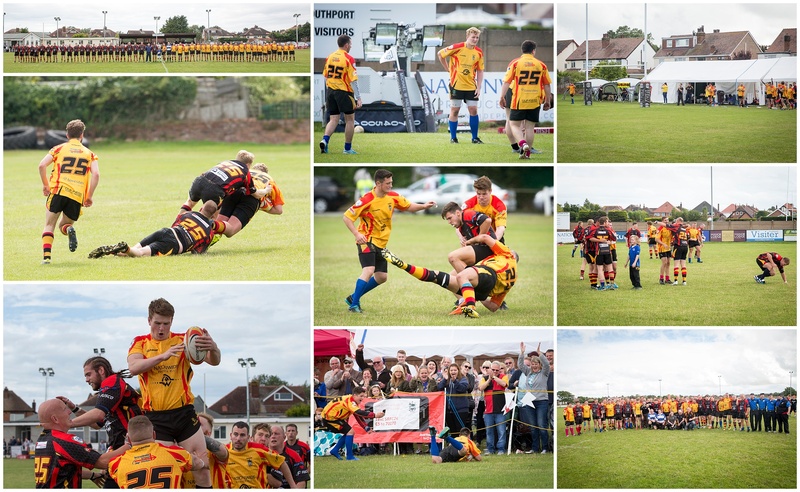 At the end of July, 2015, Southport Rugby Club set out to break the World Record for the longest game of rugby ever played and I was going to photograph the event. The purpose of this was to raise money to buy a Physio Vest for the daughter of one of the players. She has cystic fibrosis and one of these vests costs £12,000. The players were confident that they could raise this money via sponsorship. They decided that any surplus would go towards Alder Hey Childrens Hospital in Liverpool. The players trained for three months in preparation for the record attempt. The then World Record was just under 26 hours. On the 31st of July, two squads of 23 players each, lined up at 3.00 pm to start the match. They played full-on competitive rugby at a pace which nobody believed they could keep up for long – but they did. By the evening, over 800 spectators turned up to cheer the players on. The following morning, I half expected to return to an empty pitch, as both teams needed to have at least 15 players at all times and injuries had been taking their toll. Two of the players carried on, despite having broken toes and one player even carried on with a broken leg. But the two teams were still playing, despite the pain and exhaustion all the players felt. The spectators came back and carried on cheering the players, who carried on playing full-on rugby until they reached their target. When they finished, they had played rugby for 26 hours, 36 minutes and 2 seconds. 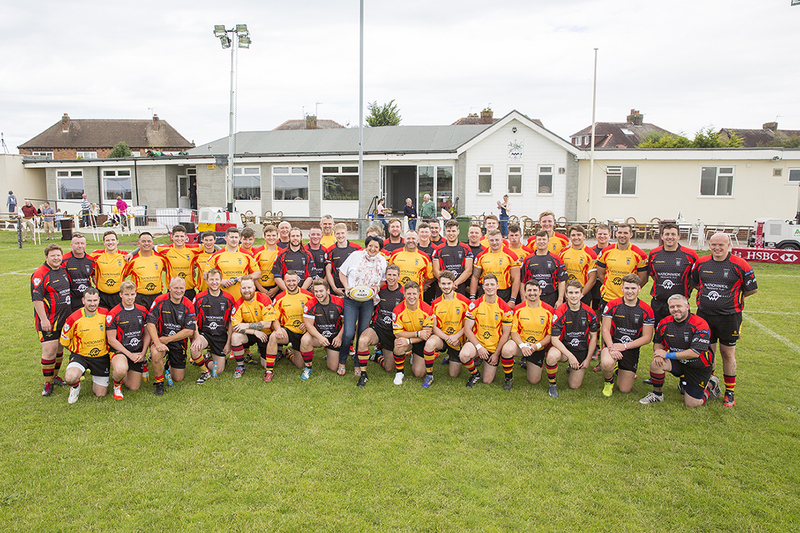 At the time of writing, this record has still to be ratified by The Guinness Book of World Records, but everyone at Southport RFC knows the boys did it and, in the process raised £28,000 for the Physio Vest and Alder Hey Childrens Hospital. I doubt if I will witness anything like again. Believe it or not – this is a colour photograph, despite looking like a Black and White image. Meet Duke and Baron, two Clydesdale horses that were the inspiration for a sculpture “The Kelpies” that was errected in Falkirk, Scotland in 2013. At its highest point, this sculpture is 100 ft high and each head weighs 300 tonnes. The project cost £5 million to create and, as well as being the largest equine sculpture in the world, they are the largest public artwork in Scotland. In mythology, a Kelpie was a supernatural shape-shifting creature that often took the form of a horse. Sculptor Andy Scott based this sculpture on two working Clydesdale horses but the sculpured heads do seem to change shape as the light changes or as you walk around the installation. Made of stainless steel, the sculpture reflects the sky around it, which is why the grey sky that is reflected in the stainless steel tiles, makes this photograph look like a Black and White image. I’ve seen photos of The Kelpies that have been taken in bright sunlight and they look completely different. If you are anywhere near Falkirk on your travels, we would recommend a visit to this amazing installation. It’s only as you walk towards The Kelpies that you appreciate the sheer scale of this work and they actually look quite intimidating at first. But when you learn that they are a tribute to the gentle giants of the equine world, which played such a vital part in Scotland’s industrial past, you see them in a different way. 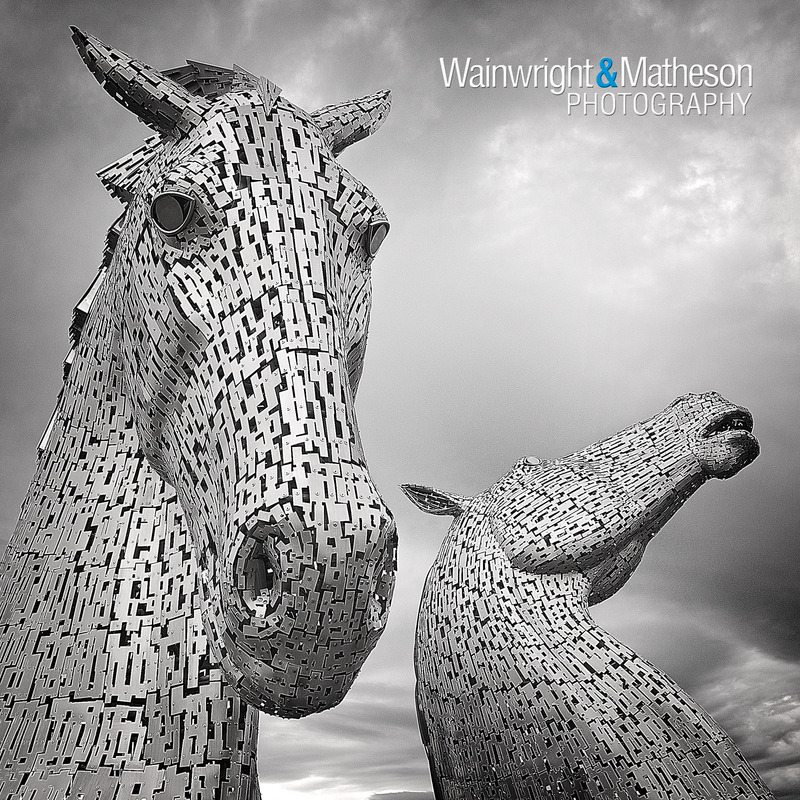 Something tells me I will be photographing The Kelpies over and over again. Photograph taken 4th September 2015 with a Canon Eos 5D Mk III and a 24mm – 70mm lens set to 24mm. Exposure 1/320 second at f 6.3. ISO 100. As a photographer, there is something rather special about getting one of your photographs used as a front cover of a magazine. Suddenly, thousands of people are goint so see an image you’ve worked hard to create. I spent 28 years in the watch and jewellery industry and read Retail Jeweller every week (when it was a weekly publication) and then every month when it turned into a montlhy publication. It always had very hight editiorial standards. In recent months I’ve been doing some work for Beaverbrooks the Jewellers, a hugely successful family owned company that started trading over a hundred years ago. It is currently run by Mark Addlestone (Chairman) and Anna Blackburn (Managing Director.) Over the past ten years, Beaverbrooks have been in the Sunday Times’ Top Twenty Best Companies to Work For. I recently shot Mark and Anna in their HO in St Annes. Retail Jeweller were running an article on Beaverbrooks in their July edition and needed some photos. What I didn’t know was that Mark was being awarded an OBE for his tremendous work for charity over many years. 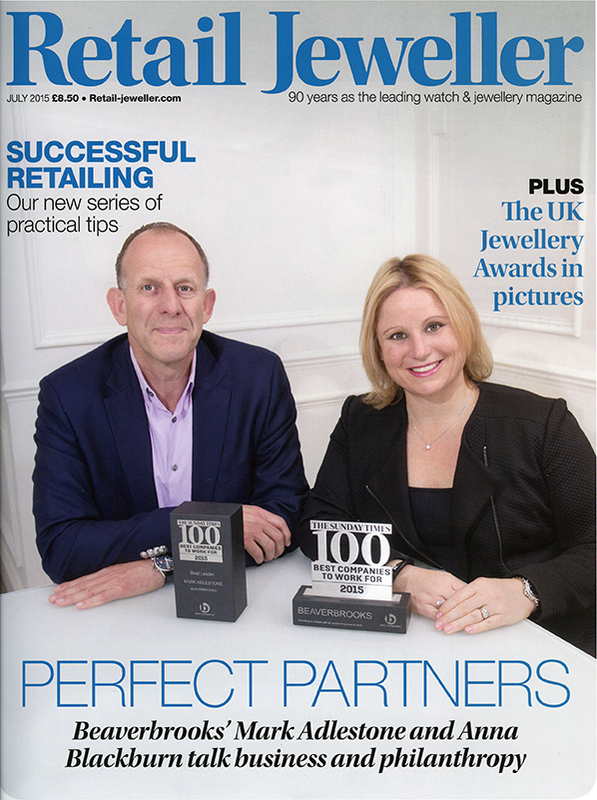 I was doing another shoot for Beaverbrooks this afternoon and Anna told me that is the first time that Retail Jeweller has used a photo of two people from the industry as their front cover. In my (eveer so biased) opinion, they could not have picked a better couple. Photograph taken 14th May 2015 with a Canon Eos 1Dx and a 24mm – 70mm lens set to 30mm. Exposure 1/200 second at f 7.1 using two Canon 600 ex rt Speedlites and a wireless trigger. ISO 100. I took this photo of Jack just before he was about to go on stage at Manchester University Students’ Union, where they were the headline act. It is a special privilege to be allowed to go backstage – whether it is to watch racing drivers in the pits as they get ready to go out and race or to watch a band as they go through their pre-gig warm up routines. It gives a photographer the chance to tell more of a story and show the building tension before a performance. 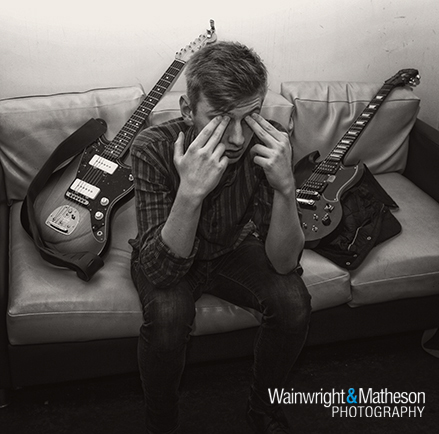 In the same way I showed racing driver Wayne Boyd getting “into the zone” in a previous post, this is an image of the band’s front man getting “into the zone” before going on stage and performing in front of a packed house. Both take a special kind of self-belief. Manchester bands have a certain persona which I would summarise in one word – “attitude.” Jack has it by the bucket full, which is why he is such a good front man. When I shoot bands back stage, I usually go for a look that is reminiscent of late 1970s Rolling Stone Magazine coverage of bands. It’s a vintage look which is meant to reproduce the soft look of Ilford FP4 film (my favourite Black and White film back then.) I processed the photo in Photoshop, using On-One Software’s Perfect B&W actions, using an action called “Rugged.” It makes me want to get one of my Canon Eos 1 film cameras out and shoot some rolls of FP4 for old time’s sake. On the night, the boys – nailed it. Photo taken 16th November 2012 with a Canon Eos 5D Mk II and a 17mm – 35mm lens set to 27mm. Exposure 1/200 second at f5.0, ISO 400, using a Canon Speedlite 550EX.